We're always harping about what women should do to avoid having a C-section around here. Most women are pretty motivated to avoid that surgery (the #1 surgical procedure performed in America, by the way), but some women have emailed or commented that they don't see what the big ol' deal is. It's a safe surgery, right? It's just another way to get that baby out, right? If it means they don't have to push for hours, then all the better. Some women say their doctor wants them to have a C-section because it's safer or easier, and they agree. So what's the problem? While most of the time C-sections are safe, a new report came out last month tells us explicitly what the big ol' deal is. Childbirth Connection, a national non-profit organization that focuses on safe, effective, evidence-based maternity care, created the report after participating in a multi-stakeholder national effort to address unsafe maternity care practices, including overuse of c-sections in low-risk women. 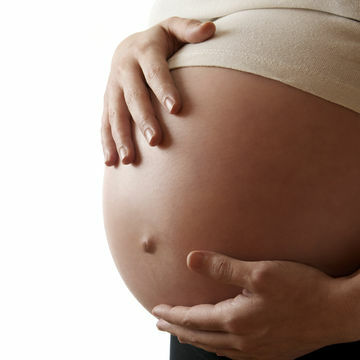 This national effort, called the Maternity Action Team engaged leading organizations including The American Congress of Obstetricians and Gynecologists, American College of Nurse-Midwives Association of Women's Health, Obstetric and Neonatal Nurses, March of Dimes and Society for Maternal-Fetal Medicine. They determined not only are we doing too many unnecessary C-sections, they're causing harm to mothers and babies. What's more, it's not just high-risk mothers who are having surgery. We often hear the argument that more older mothers and mothers with health problems are the main contributors to our rising C-section rate. This report demonstrates that in reality, we've been doing more C-sections on women at low and high risk for complications, with and without prior C-sections, in preterm and term pregnancies, across all ages, races and ethnicities. Proportionately, more low risk women are getting C-sections and the evidence is mounting that they usually don't need them, they're exposing women and babies to potential harm and not providing much benefit. All these extra C-sections are contributing to maternal mortality rates edging upwards (twice what they were in 1987). They ranked the likelihood of these complications (or tragedies) occurring from very small to very large and the exact correlations (and complete report) can be checked out here. What physical effects may occur in babies more frequently with cesarean delivery? But don't women need those C-sections they're having? Probably not in many cases, especially when it comes to repeat C-sections. Most of those patients can safely deliver vaginally. How many C-sections do we do now? In the US, about 33% of our deliveries are C-sections. Research shows that in most cases, vaginal deliveries are probably a safer choice for mothers and babies, even when complications arise in pregnancy or labor. If 33% is too many, what percentage reflects an appropriate use of C-sections? About 15%. This would mean women who need c-sections are getting them and those who don't are not. When more than 15% are preformed, we start to see problems like the ones described above. When we see less than 15%, that means women don't have access to the emergency help they need to save their lives. What reasons do women receive as to why they need a C-section? Often, they're told there are risks involved with having a vaginal birth after Cesarean. Sure there are, but there are also risks to having a Cesarean. Often they're told that labor is progressing too slowly. Yep, that happens, but it isn't necessarily a problem, except for doctors and midwives who are tired, juggling office and family hours or who aren't trained to let nature take its course. Lots of C-sections are done because doctors, nurses or midwives don't like the way the fetal heart tracing looks. Well, studies show that the correlation between funky looking strips and babies born by C-section who were actually in danger has about a 99% error rate. 99% of the time those babies are fine. The benefit of reports like this are that they get people talking and it appears, we have a lot to talk about. What do OBs think about the report? Dr. David L Keefe, MD, Chairman of the OBstetrics and Gynecology Department at NYU-Langone Medical Center says, "It's 100% accurate. If you ask any OB what they think they'll say it's all true. It's implementing change that's the problem." If you or your loved one is pregnant, check out this booklet: What Every Pregnant Woman Needs to Know About Cesarean Section at Childbirth Connection and find out what you need to know to make the best healthcare choices for you and your baby. Editor's Note: This blog was edited to reflect that the National Priorities Partnership and its member organizations did not participate in researching, preparing, or reviewing the report.